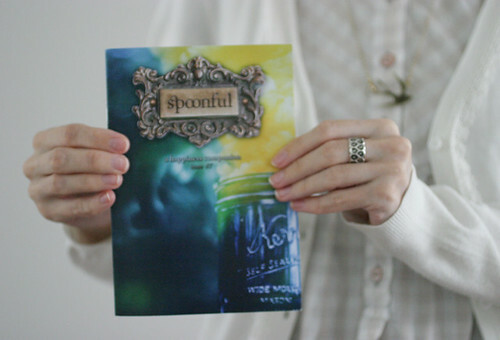 Earlier this year I was asked to contribute to the latest issue of Spoonful. 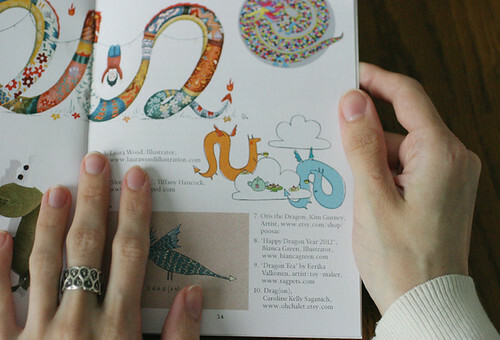 The theme of this issue, issue number 7, is magic, and magic being what it is, and this year being the year of the dragon, dragons specifically. I'm super chuffed to see my work in printed form, and it's stellar to be featured among artist and crafters like Laura Wood and Kim Gurney/Poosac! 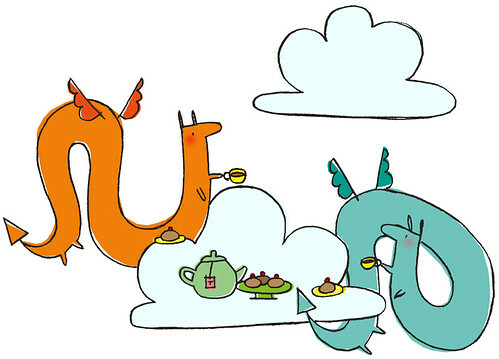 Because of course magical dragons like a nice cuppa now and then too and for those who want to know, I'm pretty sure they're drinking Earl Grey. 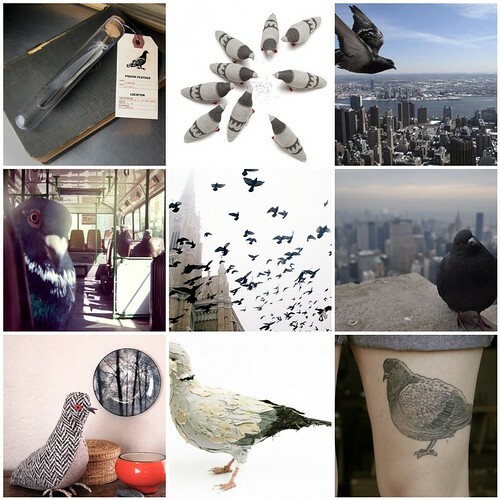 Today is Pigeon Appreciation Day, and since pigeons are my most favourite birds, and among my most favourite animals as well, I thought it pertinent to take some time out of my day to appreciate these brilliant birds. Many people think of pigeons as vermin, as rats with wings, but I think they're rather wonderful animals. They're really impressive fliers, performing amazing aerial acrobatics if need be (here's a beautiful video of a dove -which is basically just a white pigeon- in flight). Pigeons have an innate homing ability, which in addition to their skill in flying makes them super messengers and in fact, whole flocks of pigeons have been given medals (they really have) for their service as messengers during the wars. They're also tenacious, not letting the little things get them down; there's a toeless pigeon living at the Central Train Station here, that despite it's stumpy feet seems to be living a full and happy pigeon life. And, in my opinion at least, the Feral Rock Pigeons (that's what species ordinary city pigeons are) that are so disparaged by many look quite lovely with their subdued grey-hued plumage and iridescent bands of feathers around their necks. Inspired by said plumage and the simple delight that there exists a Pigeon Appreciation Day, I designed an outfit for appreciating pigeons in. 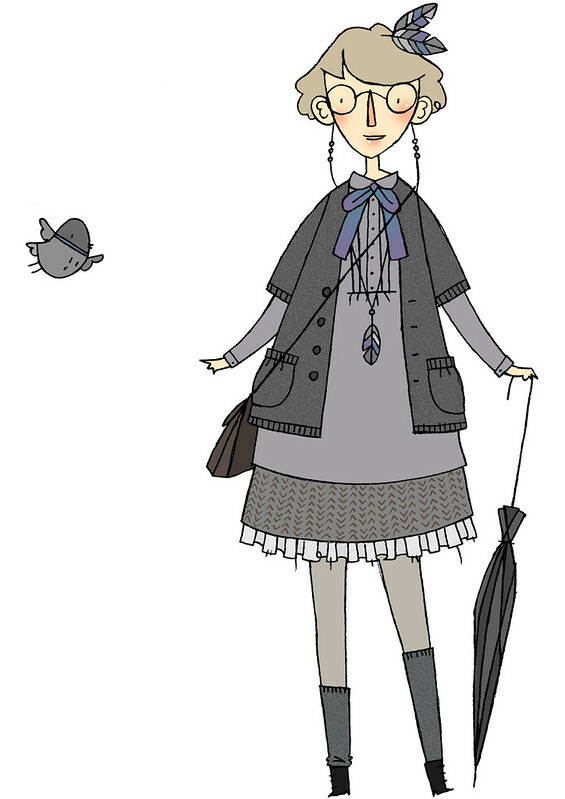 The Pigeon Girl outfit would consist of a chunky charcoal grey 3/4 sleeve wool cardie with gathered pockets, a heather grey long sleeved button-up tunic with a Peter Pan collar, pin tucks and a purple-blue-green iridescent silk bow, a mid-grey wool tweed skirt with a sheer silver grey petticoat with a frayed raw edge, putty grey tights, charcoal grey woolly socks, black lace-up ankle boots, a small grey brown leather across-the-body bag, pigeon feather necklace and head piece, and last but not least, a walking stick brolly. There would, of course, be some seeds and bread crumbs in the bag for feeding the pigeons. I also wanted to make a pigeon themed Rag Pet, but the idea came to me yesterday evening, not leaving enough time to get anything done in time for today. I'm also short on suitable grey fabrics, which is a mistake I will surely have to fix the next time I happen by a fabric store! Even though the actual "making of" part of my "Making Of" series has come to an end, there is still a post or two yet to come on this subject. If you'd like to read the whole thing, just click the "Making Of"-tag there on the right. When we last left off, I had photographed my example rag-cat, and delighted in the satisfaction of finishing a Rag Pet. Now I'd like to introduce you to Millie, the rag-cat whose making this series of posts documents. "Millie" (as suggested by Amanda of Felt Finland) won the poll with 7 votes and so at last the example rag-cat has a name! Millie is going to be the Rag Pets' "spokes-pet", being the exemplary example that she is. 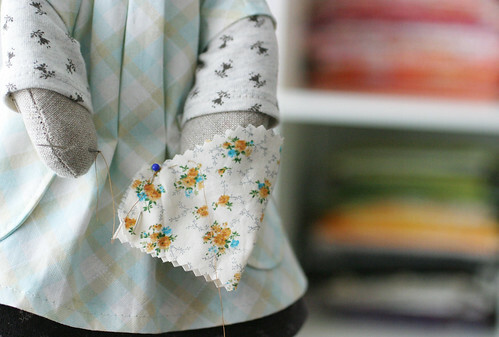 Documenting the Rag Pet making process has been an interesting and intense experience, and certainly a learning one! 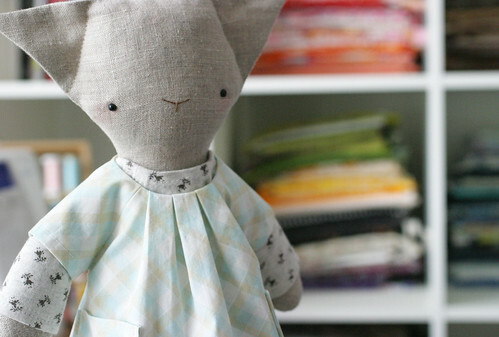 Which is why Millie won't be going into the shop, but I'll be keeping her instead. After all of this it would feel weird to sell her and really, I just can't bear to let her go. This is the very nearly last part of my "Making of a Rag Pet"-series. You can read the previous parts by clicking the "Making Of"-tag there on the right. Once a Rag Pet's outfit is all finished and ironed and done, and I've gone over everything with a tape roller to remove the inevitable cat hair (BooBoo isn't allowed in the workroom, but her hair still makes its way there none the less) and stray bits of fluff, it's time to dig out my camera (an old Canon EOS 10D with a Canon EF 50mm f/2.5 lens, for those who are interested in such details) and take pictures! 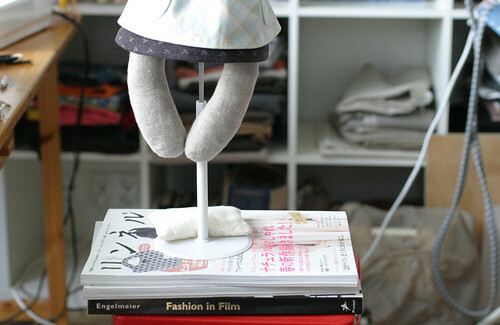 I use a lot of little tricks when setting up photos, like a doll stand to help Rag Pets stand in photos, pins to pin things into place, an empty loo roll to prop up a sitting Rag Pet in the light tent so they're not leaning directly on the backdrop making it go all wrinkly, and occasionally transparent nylon thread to stitch props or poses into place. I usually begin by taking a portrait, or "mood picture" as we knew them in school, of the Rag Pet, because it's the most fun bit to photograph and it helps tell the story of a Rag Pet, to establish their character. For these portrait shots I try to find the most fitting backdrop and props and things, like in the case of my example rag-cat, who is posed in front of my fabrics and sewing machine. I constantly keep my eyes open for possible shooting locations, and I usually plan out the portrait photo at the same time I'm drawing up the design sketch. In addition to the portraits, I also take more detailed photos of the Rag Pets in and out of their outfits. 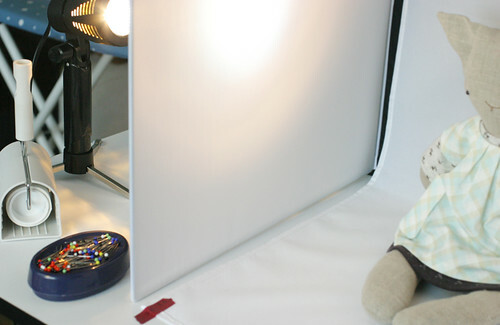 For this I set up my light tent, because it's nice to have a plain, uniform backdrop and come the darker months, an extra light or ten really doesn't go amiss! 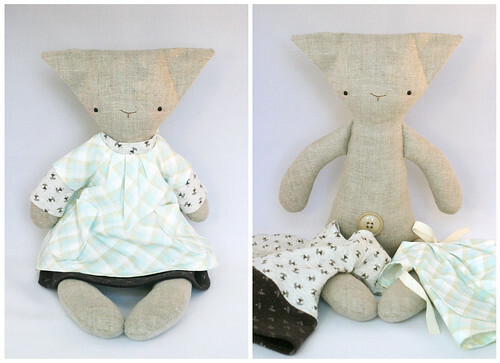 And well, there you have it: a finished Rag Pet from idea to a dressed and photographed tangible soft toy! All that's left is to make an introductory post for the Rag Pet to share them with the world at large. Or in the case of my example rag-cat, all that's left to do is to pick a name and make an introductory post. And since I'm really not good at making up my mind, I've made a poll on the Rag Pet Facebook page, so you, my dear readers, can pick what example rag-cat will be called out of all the names you have suggested for her.